Dental injuries are the most common type of injury to the face and many dental injuries can be prevented. In the United States, five million teeth are knocked out each year, mainly the front teeth! About one of every three dental injuries each year is due to sports-related accidents when athletes are not wearing mouth protection. Mouth guards also protect the lips, cheeks, and tongue. 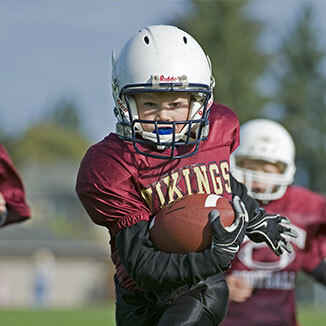 They can also assist in protecting children from head and neck injuries such as concussions and jaw fractures. Alexandria Children's Dentistry is now offering Custom-Fit Mouthguards! We use Gladiator Mouth Guards (the same company that makes Lebron James's mouthguards). They can be custom designed as well, with names, logos, colors of your child's choice! Take a look at why your player can benefit from a custom-made mouthguard. Need a heads up about why a custom fit is so important? The better the fit, the better your players perform and the better your players are protected when they take a hit to the mouth or jaw. A mouthguard is a flexible appliance made out of plastic that is worn in athletic and recreational activities to protect the teeth from trauma. Why should one wear a mouthguard? To protect the mouth from injuries. The dental profession unanimously supports the use of mouthguards in a variety of sports activities. More than 200,000 injuries to the mouth and jaw occur each year. A mouthguard can prevent serious injuries such as concussions, unconsciousness, cerebral hemorrhages, jaw fractures, and neck injuries by helping to avoid situations where the lower jaw gets jammed into the upper jaw. Mouthguards are effective in moving soft tissue in the oral cavity away from the teeth, preventing laceration and bruising of the lips and cheeks, especially for those who wear orthodontic appliances. Anytime there's a strong chance for contact with other participants or hard surfaces, it is advisable to wear a mouthguard. Players who participate in basketball, softball, wrestling, soccer, lacrosse, rugby, in-line skating, and martial arts as well as recreational sports such as skateboarding and bicycling should wear mouthguards. Currently, five sports at the amateur level require mouthguards during practice and competition: boxing, football, ice hockey, men's lacrosse, and women's field hockey. Mouth-formed protectors: These mouthguards come as a shell-liner and “boil-and bite” product. The shell is lined with acrylic or rubber. When placed in an athlete's mouth, the protector's lining material molds to the teeth and is allowed to set. The lining of the “boil-and-bite” mouthguard is immersed in boiling water for ten to 45 seconds, transferred to cold water and then adapted to the teeth. The “boil-and-bite” mouthguard is used by more than 90 percent of athletes who use mouthguards. While they are less expensive than custom-made guards, the fit is not as good and they do not last as long. Custom-made mouth protectors: The best choice is a mouthguard custom-made by the dentist. It offers the best protection, fit and comfort level because it is made from a cast to fit your teeth. How should one care for a mouthguard? Clean the mouthguard by washing it with soap and warm (not hot) water. Before storing, soak the mouthguard in mouthwash. Keep the mouthguard in a well-ventilated plastic storage box when not in use. Make sure the box has several holes so the mouthguard will dry. Don't bend the mouthguard when storing.